You are not a victim of fate or circumstances. Lessons will be repeated until learned. The answers often surprise my clients. That way we are getting somewhere – the underlying, often unknown, motives that drive their actions. By making it conscious, we then have choices – Choices about the authenticity of the goal; the strategies employed that haven’t worked, and an opportunity to re-strategize to make the goal achievable. Love and caring will always lead the way – fear gets in the way of becoming what people most desire. If I can help a person realize this, I can help them create the life they were meant to have – one with passion, with exuberance, one that feels vital and real! Helping people to NOT suffer has become my obsession. I know it’s possible. That’s why I love my work. People have used it for various purposes, but I like to use it as a tool for living more consciously – More authentic, self-actualized, congruent, non-defensive and trusting. Briefly, quadrant 1., OPENess, is the aspects of self that we easily share with others. Quadrant 3. includes the aspects about self that we keep private (HIDDEN). Quadrant 2., BLIND SPOTS, are the things others’ know about us that we aren’t aware of, and quadrant 4. are the aspects of self that are unconscious, UNKNOWN. In reality, your internal boxes are not equally divided. They may change proportions depending on the relationship or your moods. If the goal is to become a more congruent, authentic person, then we must expand the OPEN area, which requires disclosing more about ourselves, as well as being willing to accept feedback from others about how they perceive us. For example, Andy thought he was pretty open towards others. And he was. But when he received feedback from his friend, Janet, that he seemed to get defensive when she shared an opinion different from him, he just couldn’t see it. He became even more defensive. This would be Andy’s BLIND SPOT. As he thought about what Janet said, he looked into his HIDDEN quadrant for some clues. Had he always been like that, or was it just with her? Through gentle inquiry, he was able to realize that, when people disagreed with him, he felt like he wasn’t “good enough” – something he felt frequently growing up in a household with many older siblings. Andy was willing to disclose his discoveries with Janet, thus expanding his OPEN area. He was willing to respect her feedback, and as a result, expanded his OPEN area even more. The more we bring our blind spots to awareness, the more freedom we have – the more we can live an authentic life. Instead of automatic responses to factors that present themselves in everyday life, with self-awareness, we learn that we can exercise choices in our responses. I remember reading somewhere that the average person has about 300 thoughts per minute, along with the corresponding emotions, expectations, and conclusions. I don’t know how they came up with 300, but lets assume it’s true – That’s a lot of stuff going on! If you want to be clear and congruent in your communications, its essential that you slow this process down. You have to learn how to check in with yourself. 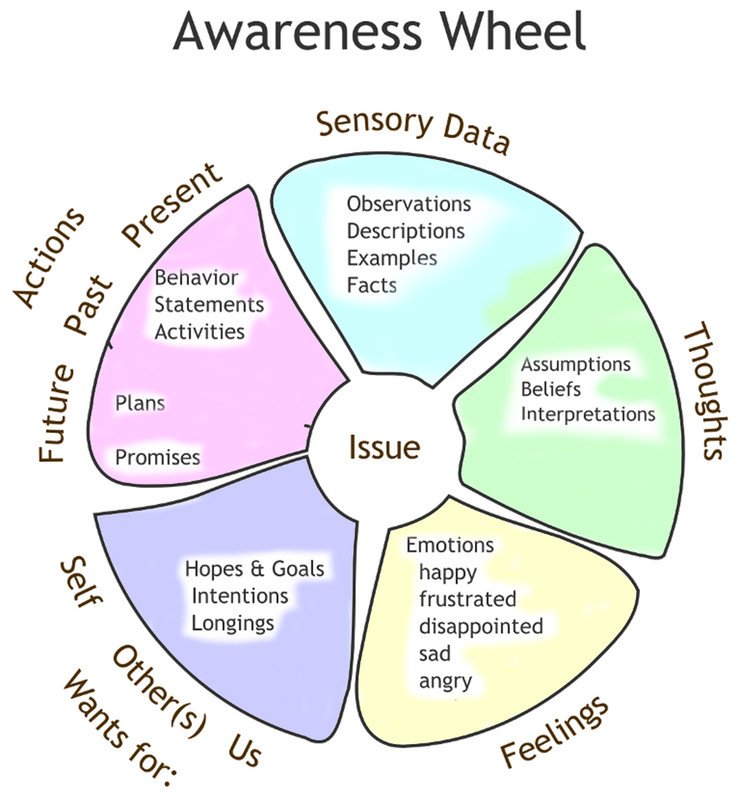 One of the tools I use with my clients in therapy is (aptly called) The Awareness Wheel. Once mastered, it helps the user understand their experiences (awareness), and, if desired, communicate clearly to someone else. Sensing or the Facts– what you have seen or heard. They are behavioral descriptions, as if seen from a video camera, without evaluation or ascribing meaning. Thinking – what you tell yourself the facts mean. They are the interpretations, beliefs, conclusions, or stories you tell yourself about what is going on. Feelings or Emotions – Keep it simple: Sad, mad, glad or afraid. Wants or intentions – What you think will fix the problem. “This is my guess, am I accurate? ” Sometimes it is a good idea to test, clarify and alter your interpretations by moving back and forth between the sensory data and your interpretations. A common problem in relationships is the result of confusing FACTS with thoughts/interpretations about what is happening. Our interpretations generate emotions, and we can be caught up in our anger or hurt because our assumptions about what’s going on is different than our partners. The model helps you to clarify interpretations and emotions by going back to the original sensory data (what you saw or heard) and checking each other’s interpretations. You may or may not get to agreement on the sensory data or the interpretations, but it’s helpful to know what each of you is thinking and perceiving. Reflective listening consists of slowing the conversation down, while assuring your focus is on being a good listener and not your defense! After a sentence or two, you, the Listener, repeat back, in your own words, what you think your partner is saying. You then ask if you heard them accurately and completely. You keep trying this until your partner says, “Yes, I feel understood.” Then you switch, and you say a few sentences to your partner, and they repeat what they heard back to you. 1. Get to know yourself. Journal regularly about your experiences using the Awareness Wheel. Learn the difference between FACTS (what you have seen or heard); THOUGHTS (interpretations/ stories I tell myself about the Facts)); EMOTIONS (body-feelings – Happy Sad Mad Afraid); WANTS (goals or intentions – what you think will fix the problem) and the ACTION taken. Keep in simple. 2. Do your Actions reflect your Wants? Reviewing one of your written Awareness Wheels, notice if your ACTIONS matched what you said you wanted. If not, what got in the way of you acting in a way that may have gotten you what you wanted? Hint: Other beliefs or wants? Write a few ideas of other possible ways you could have handled it (for the future). Example : “When you didn’t come home at 6pm (Fact), I thought you were possibly hurt or at least disrespectful of our plans (Thoughts/Beliefs), and I felt scared and then mad (Feelings). What I’d like is to trust that you will stick to our agreements so I don’t worry so much (Request/Wants). What do you think? Practice, Practice, Practice!… Now you can say anything!